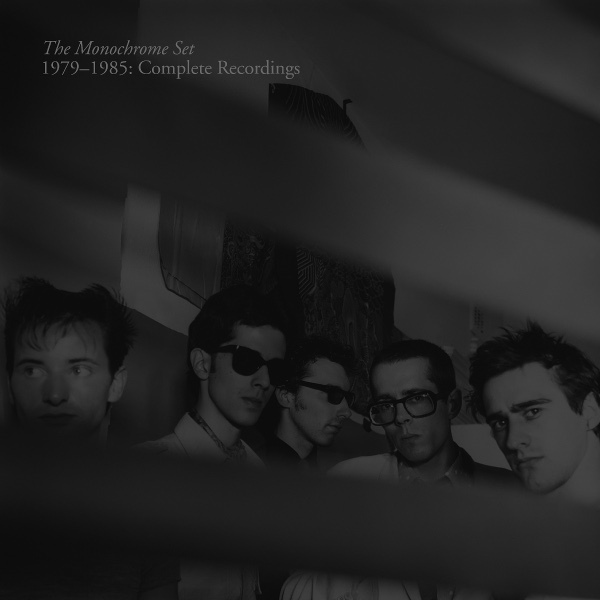 The Monochrome Set is a band that I had heard the name of but never encountered their music. I believe that I first read about them through Archie Patterson’s early efforts with Paradox Music Mailorder in the 80s. That was when the band first formed and released their intial four albums. In 1985 they went on hiatus, reformed in 1990 and were active to 1998, took another break, had a reunion in 2008, and become active again in 2010 through to the present day. This February 2018 Tapete Records released a limited edition boxed set (500 CD sets and 700 LP sets) containing their first four albums Strange Boutique, Love Zombies, Eligible Bachelors, and The Lost Weekend, plus their 25 singles released over this same time period. This is quite a massive undertaking, with the music being just 20 minutes shy of four hours. So it would take a dedicated listener to sit all the way through the six CDs/LPs. So never having listened to The Monochrome Set before, this was quite a unique experience for me, not actually knowing what to expect. The band’s name alludes to Yves Klein's monochrome paintings, but in contrast, their music is a polychromatic tapestry of sounds, styles, and music. Though they were part of the New Wave / Post Punk movement in England, that is not a fair characterization of their music. As you move from 1980’s Strange Boutique to Love Zombies to 1982’s Eligible Bachelors to 1985’s The Lost Weekend, you encounter a band incorporating a wide variety of influences and a minimal amount of synths, which was de rigueur of the times. What I hear roughly 40 years later are influences ranging from Wire, The B-52's, Julian Cope (The Teardrop Explodes), to Bauhaus plus R&B, West Coast psych, Gothic Western, dub, surf music, and rockabilly across the 68 songs in this set. But all these elements are integrated into something that belongs uniquely to The Monochrome Set. Band leader Bid (Ganesh Seshadri) never went to college or art school, though The Monochrome Set is often regarded as the archetypal art school band. In addition to the numerous art references in their music, it is also apparent that Bid loves to play with words, writing some literary lyrics and puns, e.g. “I’ll Scry Instead” and “The Great Barrier Riff.” Then there is the song “R.S.V.P.” that consists of rhyming common French phrases. So, if you are like me and have never experienced the early music of The Monochrome Set, now is a perfect opportunity to address that deficiency.